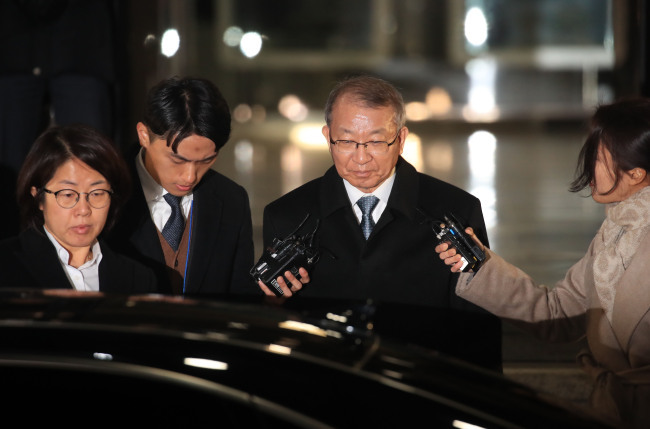 Prosecutors on Friday requested an arrest warrant for former Supreme Court Justice Yang Sung-tae in connection with a power abuse scandal. Yang was under investigation over allegations that he sought to influence politically significant trials to curry favor with former President Park Geun-hye and that he put justices at a career disadvantage if they were critical of his policies. If an arrest warrant is issued, Yang will be the first former or incumbent Supreme Court chief justice to be arrested in the judiciary’s 71-year history. The prosecutors have interrogated Yang on three separate occasions since last week. Yang has denied having any recollection of what happened, or has said that working-level officials engaged in misconduct without his involvement. But the prosecution is believed to have obtained sufficient evidence to arrest Yang. Prosecutors are said to have secured a senior judge’s notebook documenting orders from the senior judge’s superiors, as well as orders from Yang, to intervene in trials. Other evidence that could implicate Yang includes a blacklist of judges drawn up by court officials, as well as a document produced by law firm Kim & Chang detailing Yang’s discussions with the firm’s lawyer, who represented South Korean plaintiffs seeking compensation from Japanese companies that forced them into labor before and during World War II. Yang, who headed the country’s top court from 2011 to September 2017, faces 40 charges including abuse of power, leaking of state secrets and dereliction of duty. Prosecutors suspect Yang of using trials as bargaining chips to win support from the Park administration to establish a separate court of appeals. He is accused of pressuring judges in charge of politically significant trials to deliver verdicts in the Park administration’s favor and of penalizing judges who opposed Yang’s management of the court. One of the high-profile cases in which Yang is suspected of interfering involved Koreans forced to work for Japanese companies during Japan’s 1910-45 occupation of the Korean Peninsula. Yang is suspected of having intentionally delayed the deliberation of a lawsuit filed by the victims, mindful of the Park administration’s wishes to mend ties with Japan. A decision about the arrest warrant is likely to be made as early as Tuesday.